I feel like I understand most merchandising decisions. This one is a little lost on me. As reported by Comicbook.com, Cryptozoic is debuting a series of Rick and Morty trading cards, including characters, moments, and apparently even gags from the series. The trading card packs also come with temporary tattoos, standees, stickers, and scratch-and-sniff things, like, say, the people toppings ordered by an anthropomorphic pizza in “Close Rick-counters of the Rick Kind”, in case you’ve ever really wondered what that smells like. Some of the cards, 1 in every 48, will be signed by a member of the cast. So that’s neat! 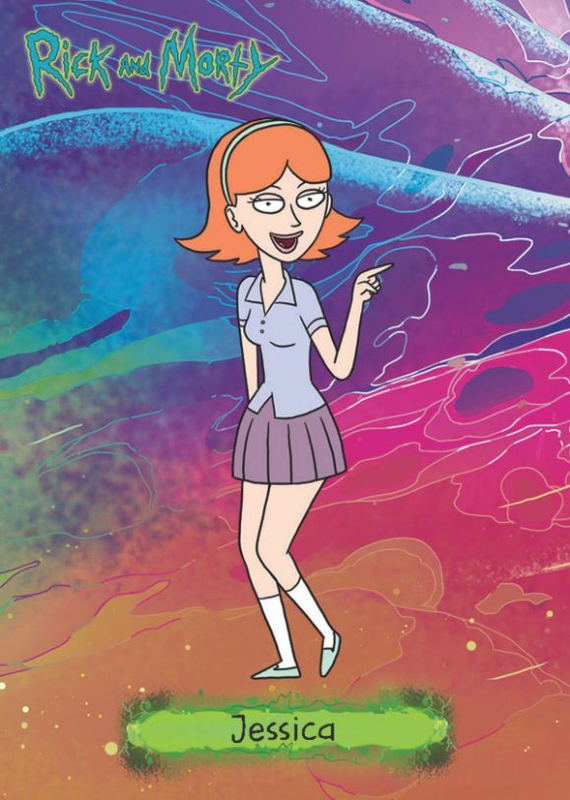 A Jessica card from the upcoming Rick & Morty trading card set. I’m still honestly pretty confused. I get trading cards, I think. Collecting characters and moments from things you like: that’s rad. But for some reason the idea of doing that for a cartoon sitcom just doesn’t grok for me. The fun of trading cards are the little details, the character statistics, the lore hints, the fact that nowadays you can usually combine them into a deck and pretend you’re going to actually go to a tournament one of these days (I know, not every trading card set has a game attached to it, but still). These are pretty minimal: just character pictures, some jokes, and the occasional malodorous sticker.